Sheikh Yaqut al-`Arshi– may Allah ta’ala be pleased with him – was the imam of the spiritual sciences, a worshipper and ascetic, and one of the greatest of those who took from Sheikh Abul`Abbas al-Mursi (radia Allah `anhu). The day he was born, in the lands of Habasha, Sheikh Abul`Abbas was informed of it, and he made a `asida for him. It was then summer time in Alexandria, and people said to him: “But `asida is only for winter time.” He answered: “This `asida is for your brother Yaqut al- `Arshi, who is born in the land of Habasha, and will come to you.” And so it happended. Yaqut al-`Arshi was the one who interceded for Sheikh Shams al-Din ibn al-Lubban (who disavowed Sheikh Ahmad al-Badawi, so that all his good deeds and rank were nullfied). Sheikh Shams al-Din had sought intersession from all the awlia, but Sheikh Ahmad al-Badawi did not accept it from anyone. Yaqut al-`Arshi then travelled from Alexandria to Tanta, and asked Sheikh Ahmad al-Badawi to change his opinion about Sheikh Shams al-Din, so that his rank may be returned to him, and Sheikh Ahmad al-Badawi complied to his request. – Later, Sheikh Yaqut al-`Arshi gave his daughter in marriage to Shams al-Din ibn al-Lubban, who made it his will , when he died, to be buried under her feet, out of respect for her father Sheikh Yaqut al-Arshi. He was called al-`Arshi, because his heart was constantly under the Throne of Allah – only his body was on the earth. It has also been said that it is because he heard the adhan from the Angels carrying the Throne of Allah. He interceded even for the animals. Once, when he was sitting in the circle of the fuqara, a dove came and sat on his shoulder, and said some secret words in his ear. Then he said: “Bismi Allah, we will send one of the fuqara with you.” The dove said: “Noone except you will satsify my need.” So he rode his mule from Alexandira to Misr al-`Atiqa (Cairo) and entered the Mosque of `Amr, saying: “Let me meet the Muadhdhin”. 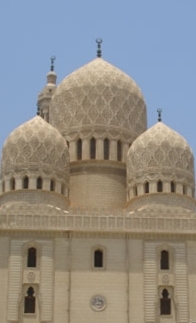 The Muadhdhin was sent for, and Sheikh Yaqut said to him: “This dove came to Alexandria and told me that you kill its young ones every time she gives birth to them in the Minaret.” The Muadhdhin said: “Yes, that is true. I have killed them several times.” Sheikh Yaqut said: “Don’t do it again.” The Muadhdhin said: “I repent to Allah ta`ala.” After that Sheikh returned to Alexandria – may Allah ta’ala be pleased with him. His virtues and glorious deeds are many and well known among the Shadhilis i Egypt and elsewhere. He passed away in Alexandria year 707 H. – may Allah ta’ala be well pleased with him. He is Abu al-Durr b. ‘Abdullah al-Habashi . He was a virtuous shaykh who commanded awe and reverence. An imam of gnosis, he was a devout worshipper and ascetic. He is counted among the most illustrious disciples of Shaykh Abu’l-‘Abbas al-Mursi. On the day of his birth in Abyssinia, Shaykh Abu’l-‘Abbas was informed of it. It was a summer day in Alexandria and he prepared ‘asida [a pasty thick gruel made from wheat flour and clarified butter for the newborn]. When told that ‘asida was only prepared in winter, he retorted, ‘This is the ‘asida of your brother Yaqut, who is born in Abyssinia, and will come to you.’ And so it happened. He was called al-‘Arshi because his heart was constantly under the Throne [Arsh], only his body being on the earth. It is also said that he would hear the adhan from the angels carrying the Throne. He even interceded on behalf of animals. One day, when he was sitting in a circle of dervishes, a dove came and sat on his shoulder, and then whispered some secret into his ear. He said: `Bismi Allah, we will send one of the devotees with you.’ The dove told him: ‘Only you will satsify my need.’ So he mounted his mule and journeyed from Alexandira to old Cairo and entered the Mosque of ‘Amr, saying: ‘Let me meet the caller to prayer [muadhdhin].’ The muadhdhin was sent for, and the shaykh said to him: ‘This dove told me in Alexandria that you kill its chicks whenever she gives birth to them in the minaret.’ The muadhdhin said: ‘Yes, this is true. I have killed them on several occasions.’ The shaykh said: ‘Don’t do it again.’ The muadhdhin said: ‘I repent to Allah Most High.’ After this, the shaykh returned to Alexandria, may Allah Most High be pleased with him. He has a legion of virtues that are well-known among members of the Shadhili Path in Egypt and elsewhere. He died in Alexandria on 18 Jumada II AH 707. He was eighty years old. His shrine in Alexandria — may Allah have mercy on him — is a site of pilgrimage for adults and children seeking spiritual graces. May Allah benefit us through him. See his biography in Tabaqat al-Shadhiliyyat al-Kubra by Muhyi al-Din al-Tu`mi (p. 222). أبو الدُّرّ بن عبد الله الحبشي كان شيخًا صالحًا، ذا هيبةٍ ووقار، إمامًا في المعارف عابدًا زاهدًا، وهو من أجل من أخذ عن الشيخ أبي العباس المُرسي رضى الله عنه. وأخبر به سيدي أبو العباس رضى الله عنه يوم ولدَ ببلاد الحبشة، وصنعَ له عصيدةً() أيام الصيف في الإسكندرية، فقيل: إن العصيدةَ لا تكون إلا في أيام الشتاء. فقال: هذه عصيدةُ أخيكم ياقوت، ولد ببلاد الحبشة، سوف يأتيكم. فكان الأمر كما قال. وهو الذي شفع في الشيخ شمس الدين بن اللبان، لما أنكرَ على سيدي أحمد البدوي رضى الله عنه وسلبَ علمَه وحاله، بعد أن تَوسَّلَ بجميع الأولياء. وسُمِّي العرشي لأنَّ قلبَه كان لم يزل تحت العرش، وما في الأرض إلا جسده، وقيل لأنَّه كان يسمعُ أذانَ حملة العرش. وكان رضى الله عنه يشفعُ حتَّى في الحيوانات، وجاءته مرةً يمامةٌ()، فجلست على كتفه وهو جالس في حلقة الفقراء، وأسرَّتُ إليه شيئًا في أُذنه، فقال: بسم الله، ونرسل معك أحدًا من الفقراء. فقالت: ما يكفيني إلا أنت. فركب بغلةً من الإسكندرية، وسافر إلى مصر العتيقة، ودخل إلى جامع عمرو، فقال: اجمعوني على فلان المؤذن، فأرسلوا وراءه، فجاء، فقال: هذه اليمامة أخبرتني بالإسكندرية أنَّك تذبح فراخها كلَّما تُفرّخ في المنارة. فقال: صدقت، قد ذبحتُهم مرارًا. فقال: لا تعدْ. فقال: تبتُ إلى الله تعالى ورجع الأستاذ إلى الإسكندرية، رضي الله تعالى عنه. ومناقبه رضى الله عنه كثيرة مشهورة بين الطائفة الشاذلية بمصر وغيرها. توفي رضى الله عنه بالإسكندرية ثامن عشر جمادى الآخرة سنة سبع مئة وسبع عن ثمانين عامًا، ومقامه بالإسكندرية رحمه الله كعبةُ الزُّوار، تقصده الناس كبيرُهم وصغيرهم للزيارة والتبرُّك، نفعنا الله به. () الشيخ ياقوت العرشي المقيم بالإسكندرية، أبو الدر بن عبد الله الحبشي، إمامًا في المعارف، عابدًا، زاهدًا ولد سنة 627هـ بالحبشة. وتوفي بالإسكندرية سنة 707هـ [«طبقات الشاذلية الكبرى» ص222]. () العصيدةُ: دقيق يخلط بالسمن ثم يطبخ. () اليمامةُ: جنسٌ من الطير من الفصيلة الحمامية ورتبة الحماميات.